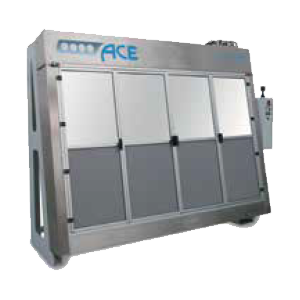 The LCV 30S and 40S cliché cleaning machines by ACE have been designed to allow the perfect cleaning of large polymer plates, placed vertically. 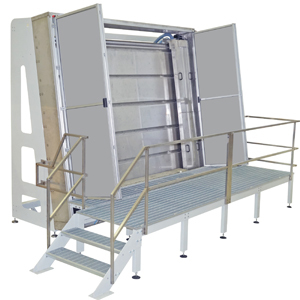 The machines have been designed to reduce the overall dimensions of the washing system, and prepared to accept polymers with size up to 1,700 mm in height to 2,200 mm in length (LCV-30S) and 2,100 mm in height to 2,800 mm in length (LCV-40S). The support surface of photopolymersis divided into two halves to allow for the optimum cleaning even of small-sized clichés. 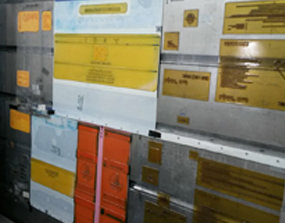 The LCV range machines by ACE feature a polycarbonate folded door access system, designed to make easier the insertion of even the largest polymers. The parts in contact with water and detergent are made entirely of stainless steel. 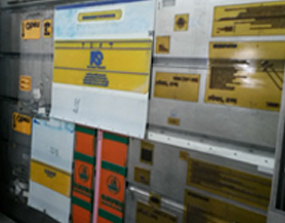 The system is equipped with an external tank that houses a high-pressure pump, which is necessary to allow the detergent to be homogeneously distributed on the printing cliché through the pressure nozzles. A brush with special bristles allows a thorough but gentle cleaning of the polymer. The brush moves on a special sliding carriage mounted on bearings and able to withstand the aggressiveness of the chemical agents used for cleaning. Several washing programs in multiple cycles, which include detergent base-cycles and water-based rinses; also the speed of passage of the carriage holding the brushes and nozzles can be adjusted. The machine is equipped with safety devices. 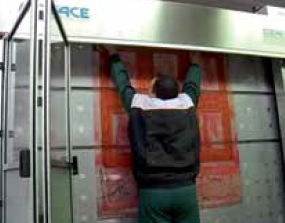 Technology and ergonomics, winning combination in the ACE vertical cliché cleaning machine for large formats. Easy access and simple operation distinguish the technology of the high efficiency cleaning system. Multi wash and rinse program, simplicity for housing the clichés, washing plan for simultaneous cleaning of even small plates. same plate, perfectly cleaned after the action of ACE washing machine.